Back in January, I had introduced 1Malaysia Clinics in urban areas to provide fast and cheap basic healthcare treatment to the lower income groups. I believe that the 1Malaysia Clinics are a success only because we have managed to serve the public and enhance access to healthcare for urban lower-income areas. After all, a healthy person will be able to contribute more to their family, the economy, and the growth of our country. As a follow-up to the 1Malaysia clinics, I launched the 1Malaysia Mobile Clinic Initiative earlier this month, which will bring free healthcare and health checks to the doorsteps of remote rural villages. These buses will ferry doctors, nurses, and auxiliary staff to treat the sick and deliver quality healthcare where clinics and hospitals are not available. This initiative serves two of the National Key Result Areas (NKRAs): to raise the living standards of low-income households, and to improve rural basic infrastructure. 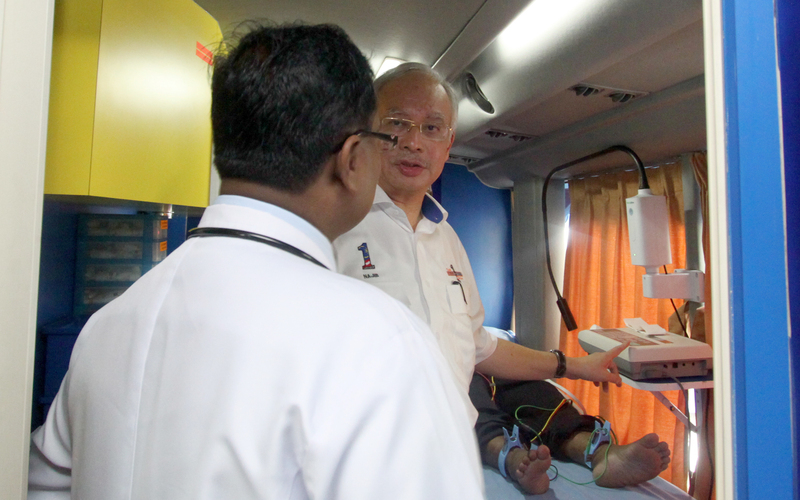 The 1Malaysia Mobile Clinic Initiative will start with 4 buses to cater to identified needful areas around the country. These buses will visit up to 40 villages a month to provide necessary healthcare, screening and medication. The staff will handle most cases on the spot while more serious cases will be referred to the nearest urban hospital or medical centre. During my travels to East Malaysia, I noticed that many villages are connected via rivers and not roads. Taking this into account, beginning next year the Government will introduce a hybrid Mobile Boat Clinic to cater to these villages so that they too can enjoy better health and receive medical check-ups, medicine and advice. I am determined that, in our pursuit of a developed and high-income nation status and in the spirit of inclusiveness, we will not forget those who are underprivileged. We will go into the deepest forests and up the longest rivers and over the highest mountains to ensure that all move forward as a nation. It is my dream that all Malaysians will have access to healthcare, no matter where they are. I am very keen and will be appreciative if you would share your thoughts and suggestions on this initiative.